The crime that occurred more than fifty years ago against Kitty Genovese still remains a mystery and the best example to define the “bystander phenomenon”. However, is it true that there were thirty-eight witnesses that heard or saw the crime and did nothing? Or was it just an unfortunate circumstance led the young soul to lose her life after being attacked in front of her apartment? 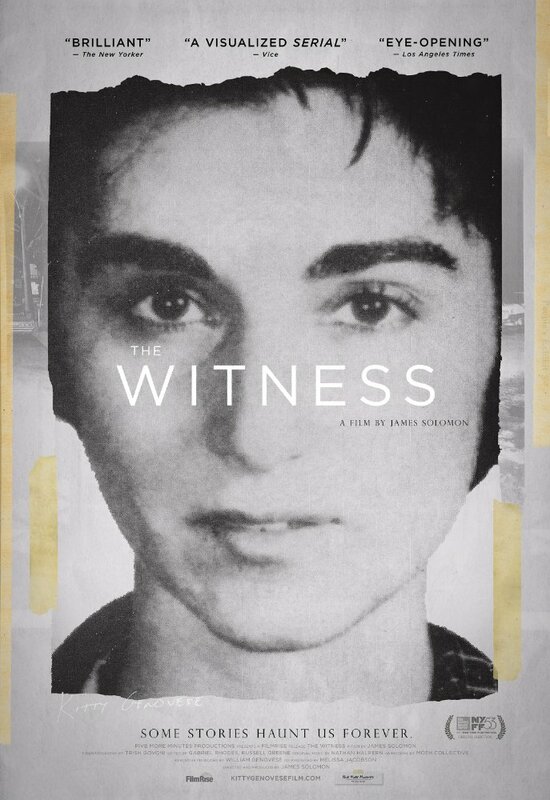 James D. Solomon’s THE WITNESS brings Kitty Genovese back to life through the eyes of her own brother, Bill Genovese, who, understandably could not find peace with the fact that his sister’s fate would have been otherwise if not for the mystery of the witnesses who did little to save her life. During my phone interview with James D. Solomon, I have learnt facts that, as a person who read books and heard enough of Kitty Genovese, I knew nothing about. Now, it is your turn to know better about the event that mass media will not, or choose not to talk about at all. MOVIEMOVESME: Why did you pick the Kitty Genovese murder as a subject for your directorial debut? James D. Solomon: As you may know I’m a screenwriter by profession and I have been drawn to stories we think we know and try to find out the story inside the story we think we know. In the past I did a scripted series for ESPN which was about New York in the late 1970s and that series explored both the New York Yankees baseball team and the city. It was an eight-part limited series I was one of the lead writers on. Then I had a film that premiered in the Toronto Film Festival in 2010 called The Conspirator that I wrote and took me eighteen years to get made directed by Robert Redford and that is the story behind the story of the Lincoln assassination; a story everybody thinks they know but the story I was telling very few people knew. So I’m always drawn to that kind of a story. In the late 90s I got interested in Kitty’s murder. Me and two others in collaboration with me pitched to HBO on a scripted project based on her murder. I was born in Boston but I grew up in New York and I’ve lived in NYC pretty much my entire life. The murder of Kitty is a seminal murder in the history of New York; it’s a defining murder and helped put out the 911 emergency system, the good Samaritan law, and groups like The Guardian Angel. So it’s a very important and influential murder that took place. I was drawn to the subject and wanted to find out more about it. At that time, I met Bill Genovese; as soon as you meet Bill it takes all about three minutes to realize he’s a remarkable man and has overcome remarkable obstacles in the course of his life. Most striking when you meet Bill is that Kitty suddenly comes to life through Bill. We know Kitty from the last 32 minutes or less, Bill knew her as well as anyone and loved her as much as anyone. As soon as we talk to Bill, Kitty becomes a person we wish we all knew. Bill said to me and I’m paraphrasing, “I needed to prove that I would not only have been someone who opened the window that night but would have gone down into the street.” He explained that is something that has propelled a lot of his decisions over the course of his life. Nothing came of the project for HBO but in 2004 the New York Times revisited its original account and questioned whether the accuracy of 38 watched more than a half hour and none called was in fact accurate. They questioned whether that story was true as originally reported. So Bill was not only disturbed by the loss of her sister but also that story of what had happened to his sister. He was determined to find out for himself what had took place, to document what happened to his sister, how that story of 38 having watched and none called the police came to be, who his sister was, not just the sister he knew but the sister he didn’t know, and who and what kind of person Winston Moseley, the man who confessed to murdering was. Those were the mysteries Bill unravels in the course. MOVIEMOVESME: Can you talk about Steven Moseley, Winston’s son, and his comments? James D. Solomon: The film explored the power of first narrators; each of us has narratives that aren’t necessarily factual or accurate but are powerful and affect our lives. Those narratives can take place in the middle of the night when you hear something outside the window like a scream and you create a narrative as to what’s happening or across 50 years when you have a photo on your nightstand and you created a narrative around who took that, what was happening, what your relationship to that person is. All these narratives that we all have, that we create, affect our lives in dramatic ways. Sometimes we tell ourselves these stories because they are the only way we can get through life. We need these narratives to be true even if they’re not. In the case of Steven Moseley, he has been told that his father perpetuated a crime, and he’s been told I believe by his own father, that his father murdered Kitty because of something she said to him. That isn’t actually factual, they didn’t know each other; he followed Kitty when she drove past him and hunted her down. But Winston Moseley also had a narrative that Kitty made racial slurs, which is actually not true. But if you look at it from the standpoint of Steven Moseley, who was 7 years old when his father committed this and multiple other crimes, he had enormous compassion for this young man’s need to hold on to a narrative that would make his father less culpable for the crime. Bill, in my opinion, had enormous compassion and understanding for Steven’s need to have this story. What I think is extraordinary is Steven Moseley’s willingness despite enormous anxiety and fear to meet Bill and to find out from Bill who he is and his own narratives. So Steven and Bill are two men who are trying to find common ground and the truth. MOVIEMOVESME: Can you talk about the approach you took to explore Kitty Genovese’s murder? James D. Solomon: A lot of the information Bill gathers over the course of his eleven years of investigation is documents, and those documents include transcripts, reports of detective interviews with witnesses, various official documents. So he’s gathering information as Bill is interviewing dozens and dozens of people over the course of eleven years. I was searching for a way to externalize to make accessible what Bill was gathering and learning. So in my mind what Bill was doing was putting together pieces of puzzle and facts. I was looking for a way to portray that, what happens when you’re gathering little bits of information. I wanted to do animation but I did not want fully formed animation, I wanted something that’s much more impressionistic in a way the info you’re gathering is sort of pieces of something. I saw a student film online made by an animator in the UK who was just a few years out of art school but it was a graduate film. There was something about her line, her drawing that was not fully formed but minimal amount of lines to create scenes. It connected with me. So the animation combined with photography and news clippings along with her designs and drawings to create pieces of a whole. MOVIEMOVESME: What did you want to get out of the scene where a woman is screaming in almost the same way Kitty did? James D. Solomon: Just to be clear it wasn’t motivated by what the audience would get from the scene. what motivated it was something Bill wanted to do. My film documents Bill’s investigation, his objectives, his reactions that he wants to do. It is not about what the audience would want to see or needs to see. It was driven by a desire to document Bill’s need, what he needed to find out. For decades Bill had been imagining what had happened the night of March 13th 1964. Bill had been running that narrative, that scene in his mind imagining. In the last 10-11 years when we’d been making we went back to the street in Queens scores of times, in the apartments, streets, vestibule. Each time we returned Bill imagined what actually happened. So I think the idea for trying to really truly understand had been in his mind for decades. In many respects what Bill does is recreating his sister’s murder is to get as close as he can possibly get to Kitty. He had very clear ways he wanted to do this. He absolutely did not wan to pull a stunt, shop the neighborhood, test the neighborhood. So everything that was done in preparation was done very above board. We contacted the city of New York Mayor’s office, got a film permit. We notified the local police precinct, Bill papered the neighborhood, we filmed in the neighborhood for a decade and so everyone in the neighborhood knew Bill and our crew. Moreover, we filmed at the first start of darkness, which in April 1st is very early. So we were filming in the early evening hours. Everyone in the neighborhood knew what we were doing. But I think Bill went in thinking that he would get a sense of what it looked like, sounded like, more like a scientist understanding angles. But I don’t think Bill anticipated what the scene was actually about was so emotional. Just to be clear we didn’t hire an actor to play Winston Moseley, the actress is just vocalizing what the witnesses who were there had expressed as was the volume of how loud it was. It is also worth pointing out that where the crime took place is exactly as it was 52 years ago. Except for the signage nothing has physically changed. MOVIEMOVESME: Things haven’t changed much since that fateful day of March 13, 1964. The only change is that now with the advent of cellphones people now record it for their own amusement. What is your thoughts on this? James D. Solomon: Your question is based on the New York Times’ account that 38 watched and nobody did something, that’s not true. But we now know that 38 didn’t watch. This defining story has a hero after all, her name is Sophia. Sophia, in the middle of the night, in her night clothes, raced down her stairs outside in the dark alley with no idea what’s outside, forced her way inside a dark vestibule and cradled Kitty in her arms. So this story in which some people saw, many heard, some may have called and one heroically raced out in the middle of the night. To tell it that way this story is a symbol of apathy, but in my mind it’s more of a portrayal of humanity and all the various responses the people made. In fact, Sophia’s presence at the scene was in most newspapers for very few days after Kitty died. Somehow she got dropped from the story. In my estimation I think what happened then is very similar to what happens now; a variety of responses. There are moments where people don’t help and should help and have a duty to help but don’t. But in that narrative you have to include that there was someone to help.